Collectors are frequently drawn to the 1909-11 E90-1 American Caramel baseball set. The colors pop off the card and, even if some of the artwork is sketchy (looking at you, lipstick-covered Joe Jackson rookie card), it’s a really popular set. The E91 American Caramel set? Not so much. For starters, it’s generally considered a ‘generic’ issue with the poses and pictures repeating for various players. That WaJo card, for example, is a lot less appealing when you consider it’s the same picture used on Harry Krause’s card. It is is lacking a bit with many key players missing. But collectors pursue it, anyway, because it’s an American Caramel set and those chasing early caramel cards are still interested in it. And if you’re hoping to complete a set, good luck. Is collecting a set impossible? Nope. You’ll see complete ones from time to time, such as this one that was consigned to REA. But if you’re putting one together, you’ll likely need a lot of patience to get there and it’s a difficult set to complete. Completing one of the three subsets is challenging but can be done. Getting all three of them is significantly tougher. If you’re new to it, the E91 set is actually three sets in one. The cards were produced over three years with E91A representing 1908, E91B representing 1909, and E91 covering 1910. Some of the players repeat in some sets but many do not. In all, there are 99 total cards – a tidy 33 in each one. That’s larger than the 25-card and 50-card caramel sets that were kind of popular but it’s not massive like the T206 set. It’s even smaller than the E90-1 American Caramel set, so why is it so difficult? Simply put, the cards are not terribly easy to find. By point of comparison with the E90-1 set since they’re produced around the same time and by the same maker, they’re seemingly harder to find. The PSA pop report shows a little more than 4,500 E90-1 cards have been graded. The E91s? Across the three sets with fewer cards than the E90-1 release, there are only about 1/3 of that with around 1,600 total graded. I always caution when using pop reports as a direct correlation to rarity. That’s really true when you’re looking at star cards vs. common cards since collectors are more often looking to grade the more valuable stars than they are a common. But eBay is also a pretty good indication of the rarity of E91s. Most times, you will find about ten times as many E90-1s available for sale than you will E91 cards. Again, the E90-1s are more popular and that leads to greater fluidity. But the difference in listings available is so dramatic that it’s hard not to notice. Has that translated to value yet? As in, are the E91s much more valuable than the E90-1 cards? Nope. Commons from both sets in low-grade condition are usually in the $15-$20 range. Sellers of E91 cards seem to be trying to equate rarity to value as they often have significantly higher Buy-it-Now prices than what the card would sell for at a straight auction. But for now, many cards in the two sets (with the exception of several of the E90-1 rarities collectors seek to complete sets) are around the same in terms of value or the E90-1s are a little more valuable. Collectors trying to piece together an E91 set have their work cut out for them. There are multiple reasons for that. First, the cards are pretty rare as it is. Like I said, even in a large marketplace like eBay, there are only a few dozen auctions generally running at once and once you get to around the halfway point, it gets much more difficult to find cards you need. Second, there seem to be very few straight auctions for them where it makes acquiring them a costly pursuit if you don’t have any patience. Even if you see a low-grade common you need, are you willing to pay $50 for it? To finish a set in a reasonable amount of time, overpaying for at least a few cards might be the only option. And for as difficult as finding them on eBay is, finding them at smaller or non-vintage card shows is even tougher. I attended a somewhat large show recently and saw only about a dozen. Rarity is the biggest problem but another issue is price for some of the more expensive cards. As I said, many stars are missing from this set so that helps a little in terms of having the money to buy them. There still some hefty ones, though. 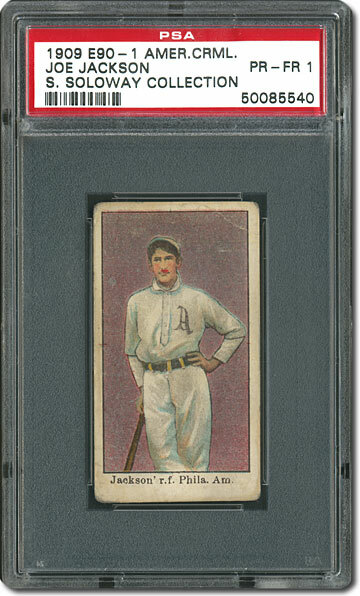 The most expensive one is the Honus Wagner, which tops $500 even in poor condition. Walter Johnson and Tris Speaker aren’t quite that expensive but still a few hundred dollars. Then there’s Christy Mathewson and Eddie Plank as well and each of those players has two cards. Even beyond that, there are another 20+ Hall of Famers to secure. Not impossible but not a short-term project, either.